‘Dream & Fly’ is the biggest magic show ever produced for a tour. 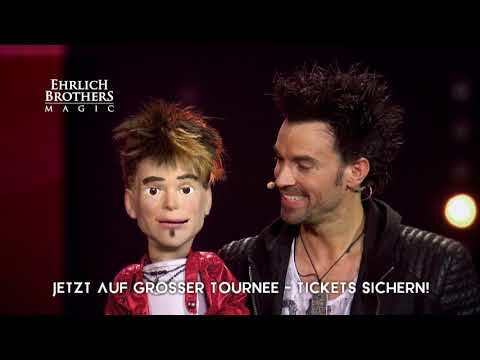 The Germans magicians – Andreas and Chris Ehrlich – will delight the biggest halls with new tricks. And they are not only staying on one stage, there is now a second stage specially build for this tour, right in the middle of the audience. The rock stars of magic will bring out a real golden Lamborghini! Even James Bond would be envious if he could see this superb sports car take off and fly over the spectators. Another illusion makes children’s dreams come true: the world’s biggest candy box will appear on stage, full of sweets that will be scattered among the audience! Another novelty: the two German brothers come this time with their own live music band! Live music will add grooves and madness to their tricks. Twenty lorries will be needed to transport all the equipment for this spectacular show! The Ehrlich Brothers had already enchanted millions of spectators with their previous shows ‘Magic: Live your dreams’ and ‘Fascination’. They had stirred up such a magical fever that additional dates had to be scheduled to meet the huge demand! And now, the show is getting even wilder and more spectacular!